Giving your mind and body a good rest is essential. Indulge yourself with the simplicity and elegance of Furinno Bedroom Collection. This collection consists of mattress, bed frame, pillows, bedsheet set, night stand, closet storage (bins), etc. Our bedsheet sets are designed to offer comfortable sleeping experience. Our bed linens are made of brushed microfibers which is soft, breathable, and also wrinkle and fade resistant. These premium sheets are elastic and durable, they fit perfectly on all corners. Also, they come in multiple refreshing colors that fits most styles. The sheets are easy to clean, just wash them in washing machine and tumble dry low. Also, the sheets sets are available in different sizes to suit all mattress: Twin, Twin XL, Full, Queen, King and California King. 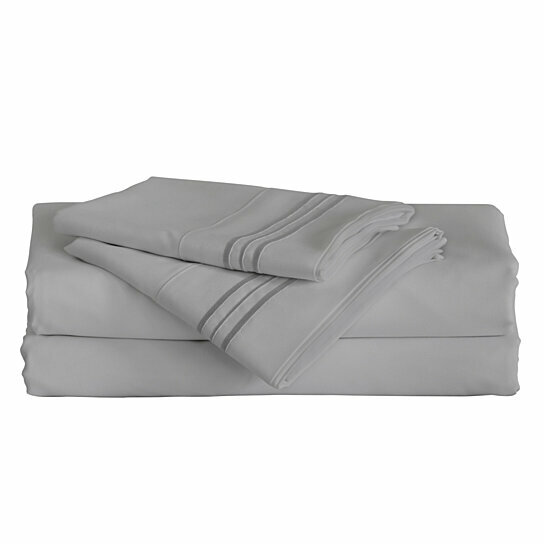 All sets include 1 flat sheet, 1 fitted sheet and 2 pillowcases except for Twin and Twin XL which only has 1 pillowcase. PREMIUM BRUSHED MICROFIBER: softer and more breathable. Wrinkle and fade resistant. Machine wash cold, tumble dry low.